The designers and stylist behind all our favorite cowboy chic ensembles featured in Solange’s latest release. Solange’s long anticipated album, When I Get Home, dropped last month and, as expected, she delivered some serious looks in the project’s short film. The album explores Solange’s roots in Houston, Texas and arrived in a timely manner as Black southern rural fashion seems to have risen to the forefront of style and pop-culture. In what Twitter memes have jokingly named “the ‘Yeehaw’ agenda”, we have seen a resurgence in the popularity of cowboy-inspired looks. Some of Hip-Hop and R&B’s current it girls like Rico Nasty, Megan Thee Stallion, Kelela, and Cardi B have participated in the revival of rural southern fashion, sporting looks like embellished cowboy hats, cowboy boots, and chaps. For Solange, this style is not an mere aesthetic choice, but rather a symbol of her own heritage as a Texan and an ode to the Black cowboy. We can all thank Solange’s stylist Kyle Luu for helping to bring the artist’s vision to life in When I Get Home’s 33 minute visual. Luu, who has worked closely with the singer for years, styled her with a distinctly Texan aesthetic combined with Solange’s signature avant-garde futurism. Check out some of the looks featured below. Solange in Thierry Mugler SS1991 and metallic cowboy boots styled by Kyle Luu. Solange in a Yeha Leung jeweled body piece and Peter Do sheer cowboy boots styled by Kyle Luu. Solange in a sheer Esmay Wagemans piece styled by Kyle Luu. 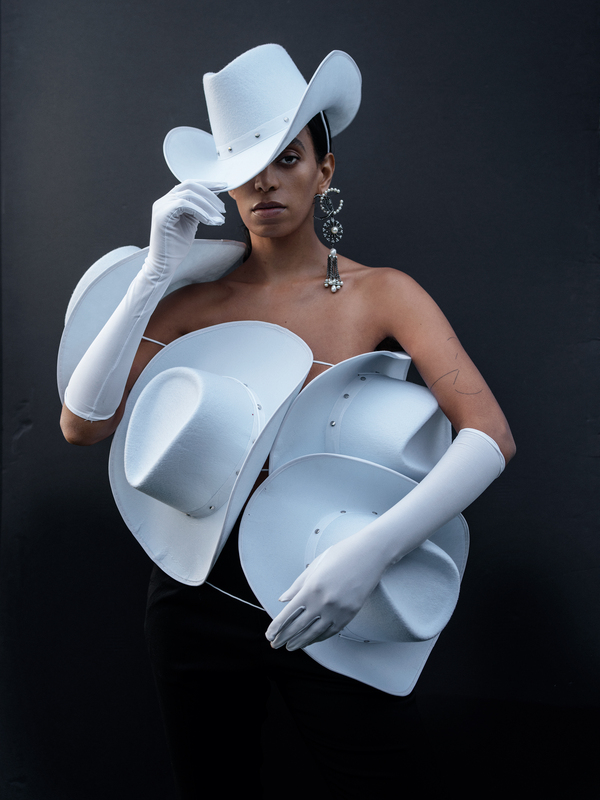 In a look which arguably embodies the so-called “Yeehaw Agenda”, Solange is covered solely by cowboy hats designed and styled by I-D fashion editor, Ib Kamara. Solange gave us a taste of her new project in the latest I-D magazine issue which came out just weeks before the album’s release. While Solange isn’t the only nor the last artist to prove you can make cowboy chic, she sure does it well! Like much of her work, When I Get Home reminds us of a narrative which is often left out of the spotlight. As a Texas native, the singer truly comes home to honor Black cowboy culture in the rural south.